Basil was born in Caesarea of Cappadocia, in what is now central Turkey, in 329. The persecution of Christians had ceased, but his parents had lived through these times. He originally planned to become a lawyer and orator, and studied at Athens from 351 to 356. When he returned home, the influence of his sister, Macrina, led him to a monastic life instead, and he founded a monastic settlement near his home. He remained there for only five years, but hugely influenced his community, basing the communal life of the monastery on Christian mutual love and service. In 367, when Cappadocia suffered a widespread famine, Basil sold his family's land in order to buy food for the starving, persuading many to follow his example, and actively preparing the food himself. In this crisis, he refused to allow any distinction between Jews and Christians. He built a hospital to care of the sick, housing for the poor, and a hospice for travellers. Basil was ordained in 362, in order to assist the Bishop of Caesarea, whom he succeeded in 370. By then, an Arian emperor, Valens, was the ruler whom Basil was opposed to. The Trinity was their fundamental area of difference. When Valens visited Caesarea in 371, he demanded the theological submission of Basil, who refused, whereby a long political dispute ensued between the two. His most famous writings include the "The Six Days", a series of nine sermons on the days of creation, in which he speaks of the beauties of the created world as revelations of the splendor of God. His “Against Eunomius” defends the deity of Christ against an Arian writer, and his On the Holy Spirit speaks of the deity of the Third Person of the Trinity, and the rightness of worshipping Him together with the Father and the Son. In his “Address To Young Men”, originally written for his nephews, he urges Christians to make themselves acquainted with pagan philosophy and literature, arguing that this will often lead to a deeper understanding of Christian truth. His personality comes through most clearly in his letters, of which more than three hundred have been preserved. Some deal with points of theology or ethics, some with law, and many with everyday affairs. 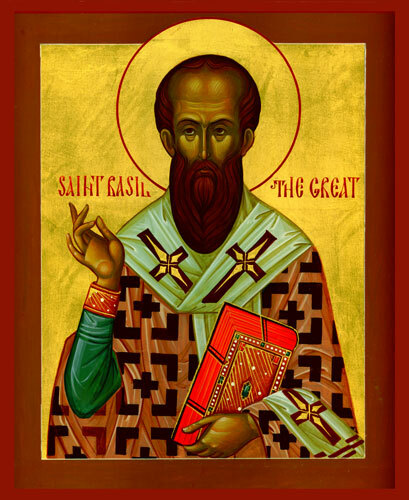 Ten times a year, Eastern churches use the Liturgy of St Basil rather than the more usual Liturgy of St John Chrysostom. 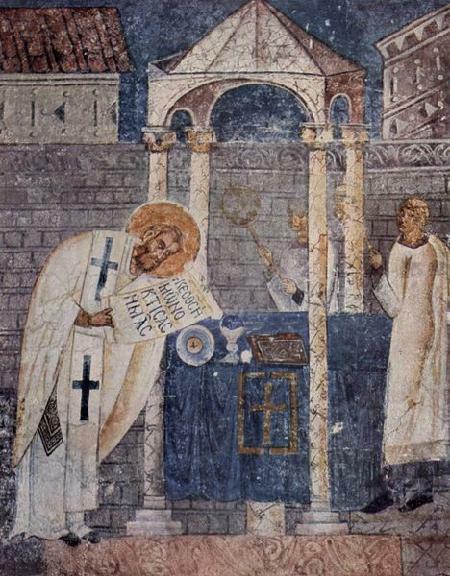 (above St Basil consecrating the Gifts in Ohrid Cathedral, during the Mass that bears his name) It differs in having a more elaborate prayer of consecration offered over the bread and wine, expressing some of his thoughts and probably composed by him personally. Basil died in 379, shortly after the death, in battle, of the Arian Valens. This removed the chief threat to the Nicene faith to which Basil had devoted his life. He was mourned by the entire city, and the weeping crowds at his funeral included Christians, Jews, and pagans. In the West, he is considered to be one of the Four Greek Doctors of the Undivided Church. The most famous Cathedral dedicated to St Basil - in Red Square Moscow.